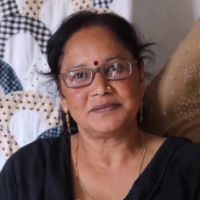 Pratibha Upadhyaya did her schooling from MKP, then she did her BA from DBS and after that she did her diploma in Tailoring and Cutting from ITI. She has been working with Himalayan Tapestry since 2006. Tailoring is a diverse crafting profession which allows players to use various cloths and other reagents to craft clothes. "After doing my schooling from MKP Dehradun, I did my BA from DBS. Thereafter I did a diploma in Cutting & Tailoring from ITI. I am working with Himalayan Tapestry since 2006."